Sandpoint, Idaho (February 27, 2018) This past weekend, on a snowy winter morning in Sandpoint Idaho, headquarters to EzyDog USA, dogs of all shapes and sizes lined up to compete, while raising money for the Panhandle Animal Shelter during the twentieth annual Eichhardt’s K-9 Keg Pull. Sporting EzyDog harnesses, the dogs took turns racing down the snowy track, empty beer kegs in tow, in pursuit of the best time in their class. Proud pet owners helped incentivize their dogs on the track as they raced toward victory while fans cheered from the sidelines. The EzyDog team was on site supporting the event and fitting the dogs with Chest Plate Harnesses to give them the pull they needed to perform their best. 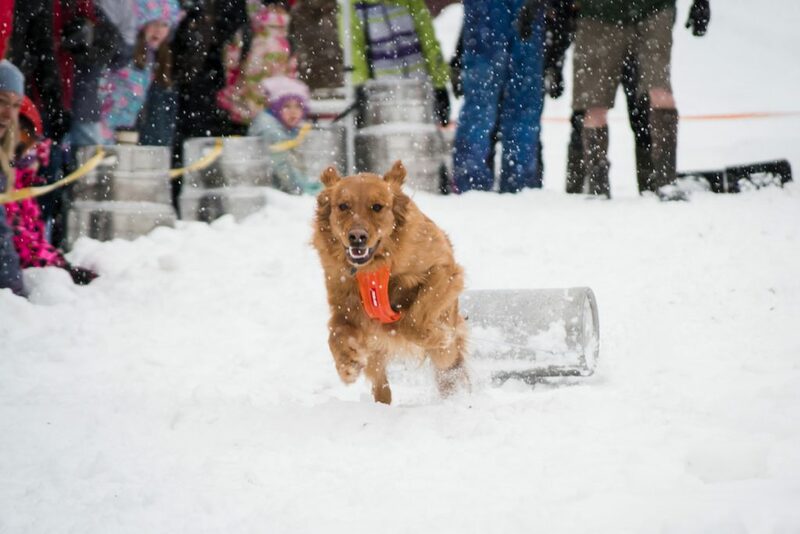 The K-9 Keg Pull is one of many events held during Sandpoint’s Winter Carnival and never fails to draw a crowd. The local community and visitors abroad show up to revel in the light-hearted competition while generating revenue for their local shelter every year. Depending on their size, dogs pull everything from full-sized kegs to beer cans and the spectacle is full of surprises, both exciting and humorous. The event is full of socializing for dogs and humans alike. Based in the mountain ranges in Idaho, EzyDog makes a line of products encompassing the rugged outdoor lifestyle dogs love along with the comfort and style pet owners prefer. EzyDog is the manufacturer of the Original Shock Absorbing Leash that combines the latest in sports technology with the durability dog owners demand. Their unique and highly functional leash systems are designed for comfort, control and safety, paying special attention to dogs that pull or are in training. All EzyDog Products are designed to help both owners and pets get more out of the great outdoors. For more information, please visit www.ezydog.com. The Panhandle Animal Shelter serves the inland northwest providing for approximately 1600 lost, abandoned, neglected and abused dogs and cats every year. At the new 27,000 sq. ft. shelter cats and dogs receive a safe, nurturing environment and the opportunity to be placed into qualified new adoptive homes. PAS programs also assist in the safe and prompt return of lost pets, in population control by offering spay/neutering assistance programs and altering all animals prior to adoption and community outreach education. Dogs go into playgroups twice a day to help relieve stress and get their energy out. A thirty minute playgroup is like a two hour walk with mental stimulation.